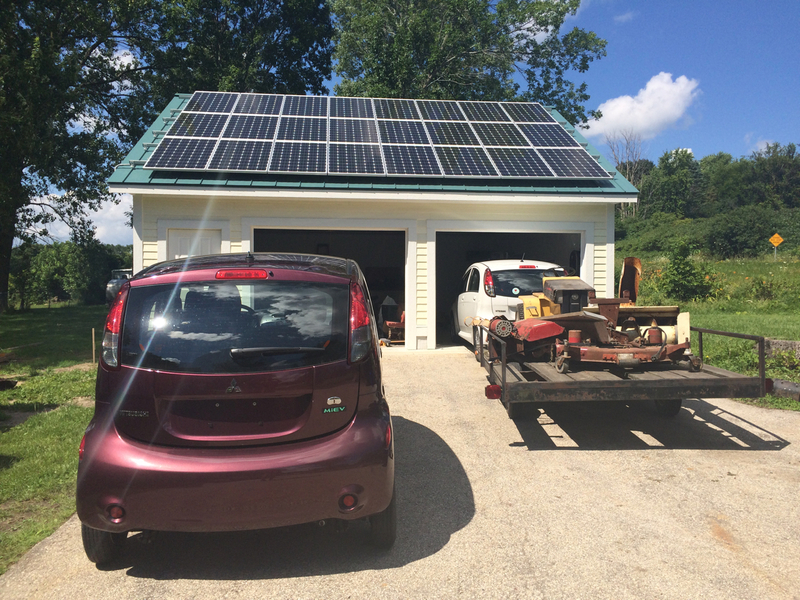 This weekend, I said good-bye to the iMiEV. If you’ll recall, a few years back I purchased an iMiEV through an auto salvage auction. I was really hoping to be able to fix it and get a great deal on an electric car. Long story short, the car was shot, with the Atlantic Ocean literally falling out of the battery pack. The upside is that I later purchased my daily driver, the white iMiEV, and would then have a source of parts for it. So, earlier this summer, I met “Pdon” (just like Don, only with a P at the begining) who was interested in purchasing the purple car in entirety, as he has TWO Mitsubishi iMiEVs and his brother has a third. We made arrangements, and finally had a date where both of us could get together to make the sale and get the car out of my driveway. I had also agreed to purchase from a friend his entire lot of ElecTrak electric lawn and garden equipment. The guy was clearing out his barn and wanted it all gone. That left me needing to make a trip out with my iMiEV pulling the 12-foot cargo trailer and loading it up in the guys’ barn before trying to get home in time (and making it on one charge!) to sell the purple iMiEV. On my way back, I saw some electric cars that I recognized. The Watertown High School Electrathon team was holding a fund-raiser, selling bratwurst, at the local meat market. I stopped in to say hello to the instructor, Jesse, and see what the students were up to. A few years ago, leant a hand to the team by doing some consulting and loaning out some equipment to the team. 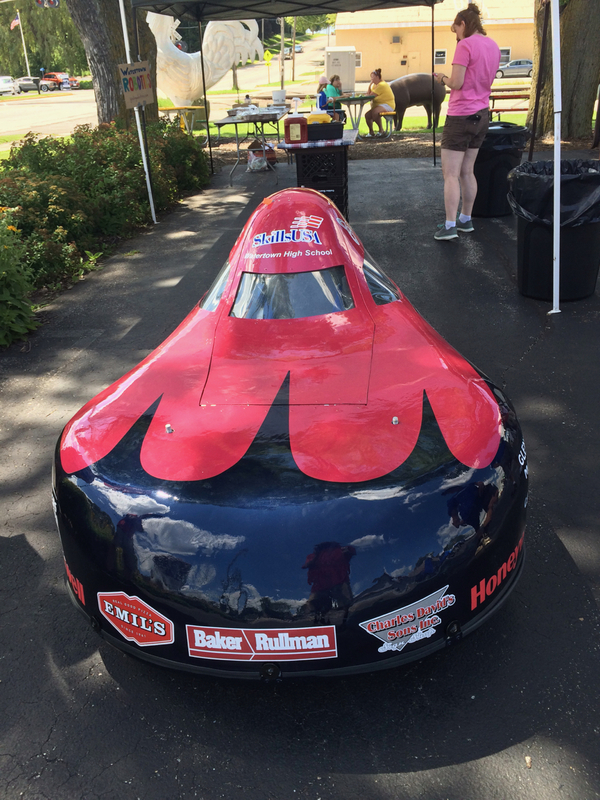 The students showed me their latest car, a fully-enclosed fiberglassed three-wheeler, which looked fantastic. The students also had some great comments and questions on instrumentation and telemetry about their project. In return, I showed them my electric car and the electric tractor and equipment up on the trailer. When Pdon showed up, we lined up some heavy wood planks to his trailer. The iMiEV unfortunately can NOT steer. I was able to bust loose the ignition, but the steering still felt locked; perhaps because the electric power steering wasn’t powered up? Ahead of time, I had already put the front wheels of the car on a pair of furniture dollies, which allowed me to move the car’s steering end. The car was also in neutral, but still difficult to roll. I think that the drum brakes in the back are probably rusted up. I was able to move the car, but only by pulling it with a tow strap attached to my electric tractor. Once we had the car all lined up with the ramps and trailer, we used a combination of an electric winch and chain hoist to pull the iMiEV up on to the trailer. 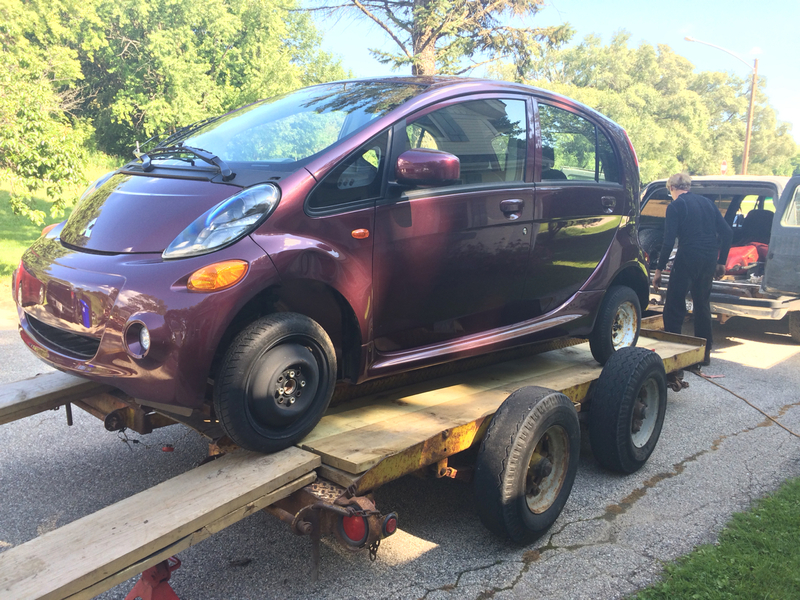 After exchanging money and the salvage title, Pdon was on the road, and I got to wave goodbye to the purple iMiEV. The next day, I had one more run back past Watertown to get the rest of the ElecTrak parts, motors, battery charger, wheel-weights, and some other parts which I could fit without bringing a trailer. I backed all the way up into the barn and loaded all the gear into the back. Once packed, I said goodbye to the seller, Chris, and pulled forward out of the barn. As I did – KABAM! The car came to an instant dead stop! I backed it up a foot, then pulled forward again with the steering turned different. Theres a big concrete ledge going in to the barn, followed by a steep drop to the gravel driveway. Sticking my head under the car, I could see what had happened. The car had dropped just exactly wrong with the concrete lip of the barn catching the underside of the car. The exact point at which it happened was the leading edge of the battery pack. Right there is a steel bracket which sticks down farther than the rest of the pack. That bracket slammed into the concrete, denting it, but otherwise causing no damage. Of any part of the car to absolutely SMASH into concrete, that was probably the best part, other than my teeth still chattering from the sudden stop. I drove back home with no issues and the car seems fine. Finally now THIS morning, I get a call out of the blue from a California phone number. It was a woman who got my phone number through PlugShare. She was traveling from Chicago to Minneapolis in a Tesla Model X and had stayed at a local hotel last night, but was only about to charge from a 120V outlet. That wasn’t enough juice to get her to the next SuperCharger (in Madison, WI.) The vehicle was also still very new to her, so she didn’t have much experience with what to expect for charge times, 120 vs 240V, or know too much about the various power adapters. I gave her directions to my place, and not too long later, a bright red X pulled up. We hooked her up to my NEMA 14-50 outlet with the Model X charging at 40 amps. 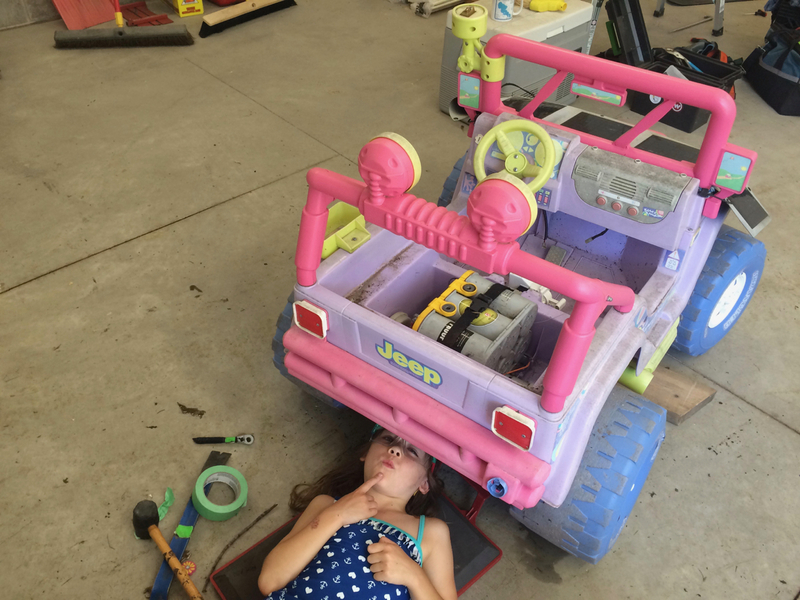 While the car charged, we chatted and I gave her the quick tour of the garage and the solar system. The car charged for a little over an hour. Although 40 amps is a whole lot more power than my solar panels can produce, the solar is making power all day. Two hours of solar today should completely cover charging the Tesla. So, there you have it. 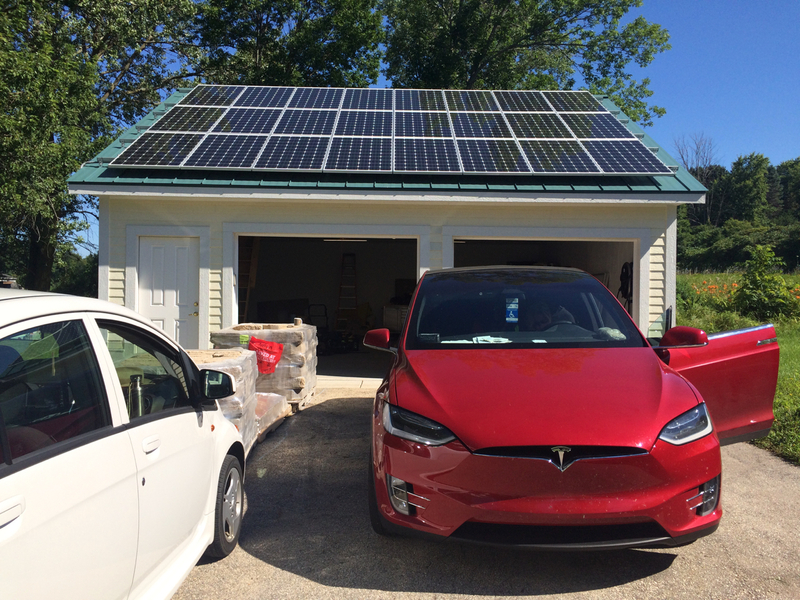 Just a typical weekend of electric cars at my house; Transporting Electric Tractors, meeting High School Electric Car Builders, loading disabled parts cars onto trailers, smashing my car, and solar-powering Teslas! We’ll see what the afternoon brings! Ha! I told the guys at MMS they should put a buffer zone around that telephone pole. But the company that did the striping had a different theory about how wide the spaces should be, and they said there wasn’t room (although if you measure the spaces, you’ll see that they’re all different widths). I always enjoy your articles…..whether about canoeing with family or for 300 mpg.org. I don’t think we can ever possibly put enough around that pole to make it safe. It’s in a TERRIBLE location! 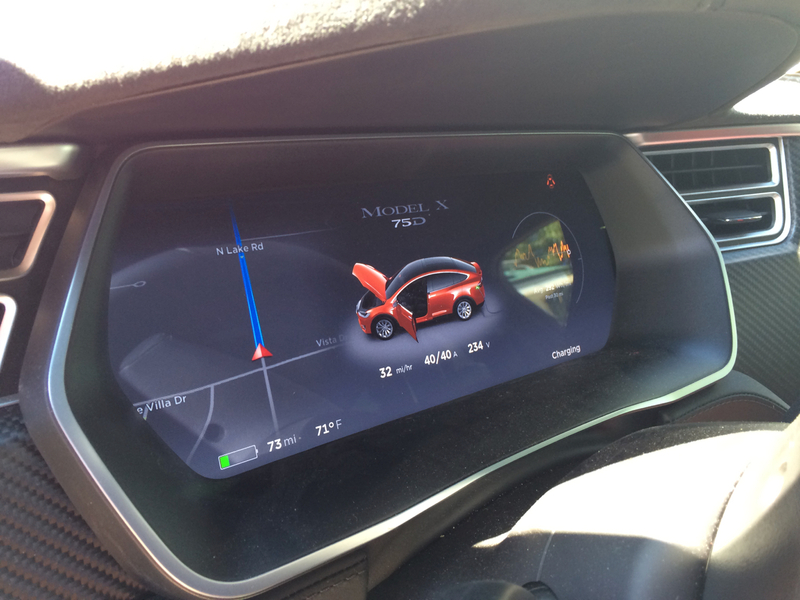 Great that you were able to help out the Tesla newbie. Surprised she didn’t stay overnight at a place with car charging, as that is now quite common around the country. I still admire you for taking that chance on the raspberry i-MiEV as it sure seemed like quite the opportunity at the time – and thanks for sharing that battery disassembly video as none of us had seen the insides of that pack. Previous post: Game of Drones!